And so begins the monthly photo challenge with my good friend Dave Joyce. This idea began a little while ago through a conversation about our photography and the challenge that it can be to sometimes get out a shoot. Both Dave and I work full-time and have committments that make it seem difficult to find time to get out there with a camera in hand. The monthly challenge occured as a way to inspire us to get out shooting by providing a starting place for ideas and goal. The basic idea is that each month we choose a theme and set a deadline. When the results are in we post both images on our blogs. There’s no winner – the idea isn;t about competition, but challenge. We wanted to get inspired and get out shooting, and in that regard the first challenge was a success. I don’t know if I am 100% happy with the image I came away with, but the challenge got me out shooting and it’s a picture I might never have taken otherwise, and that in itself makes me very satisfied. So without further ado, here are the results. This month’s theme was “rock”. As always, click the photos to see larger versions. Dave had this to say: “It’s from my parents garden and was my first experiment with HDR photography. I’m not sure if the HDR added anything, but it was useful to learn. Details: f5.6, 1/13 sec. ISO 400, 18-55mm lens (at 50mm). With exposures bracketed at -1 2/3, and then merged into a single image. The photo was taken on the Conestogo River on the north end of Waterloo, Ontario. 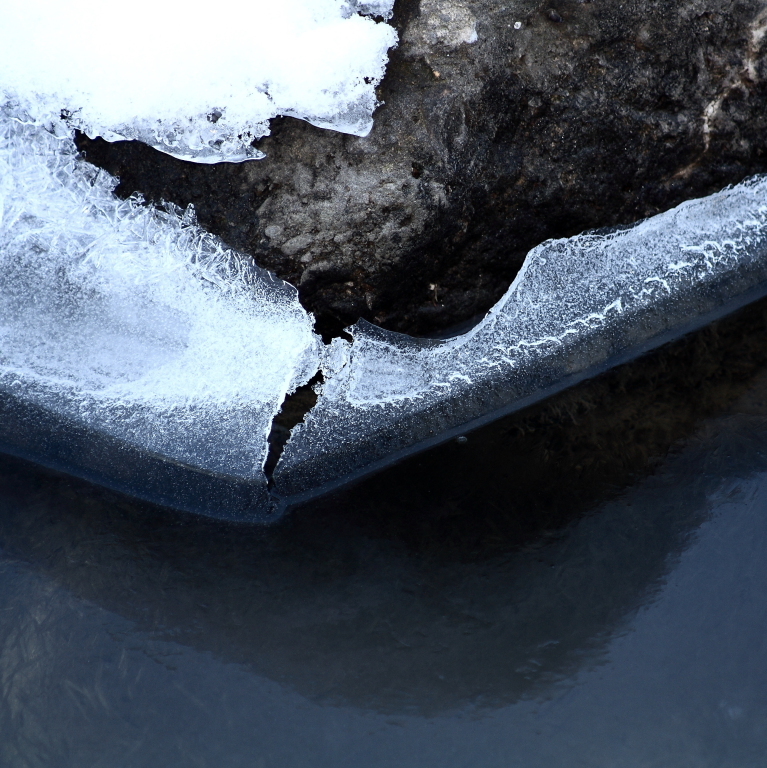 The rock was snow capped with ice slowly forming around it as the water slowed in passing by. Details: 4 second exposure at f5.7, 200mm (35mm equivalent: 323mm ), ISO 100. This entry was posted in Details, Monthly photo challenge. Bookmark the permalink. What a great idea to inspire and push yourself to shoot. I love the color in Dave’s photo and the HDR is subtle giving it detail but looking natural. And your photo is so interesting, to see the ice forming around the rock like that. Fascinating! Thanks Amber! It has proven to be a very fruitful endeavour, and we’re hoping to keep it going monthly so we can keep our momentum. If you’ve ever interested in participating, let me know and I’ll loop you in 🙂 Glad you enjoyed these ones.